* Like many another athlete he also had a reputation for turning up late for races – on one occasion he missed the club bus for the Cross Country Championships and turned up at Hamilton Racecourse in a taxi presenting the team manager with a bill for £4:15:0 which was a lot of money. * A believer in self massage he could be seen massaging himself ‘from the big toe up’ before races. * Among his other idiosyncrasies was a belief in fresh air and he would sleep at night with the windows open. * He was a great believer in Yoga exercises long before stretching of any sort was common in athletics. But above all else he was a very good runner – Scottish marathon champion, cross-country internationalist and winner of many medals of all colours as a member of a very good Shettleston Harriers team.- and should be remembered as such. He was racing on the roads at the time when the Scottish Marathon Club was doing its very best under the efforts of Dunky Wright and Jimmy Scott to foster marathon running uin Scotland. They managed to get races put on all over the country and at a variety of distances. Unfortunately, the eve nts did not enjoy the parity of esteem with track and field that was to become the case in the 60’s and 70’s so the races were often not reported on and the men involved did not get their due. 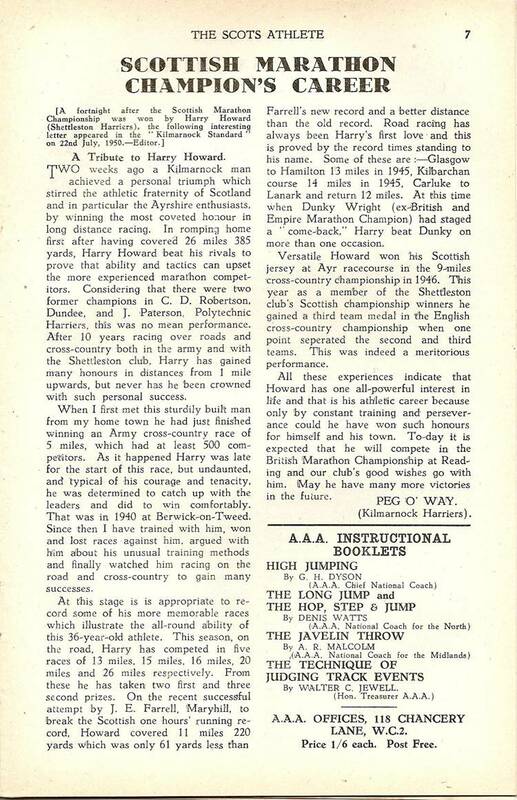 The Shettleston Harriers history reports in a section called: “A helluva man” Harry Howard: “He was a bricklayer from Kilmarnock and joined Shettleston during the war after he switched from boxing to running while in the Army. His first major win was at the age of 31 in the Nigel Barge Road Race in 1945”. In March of the same year he he ran second to Emmet Farrell in the Scottish Cross-Country Association’s senior eight mile race at Dalziell Estate, Motherwell, and in 1946, after finishing ninth in the National (leading Shettleston to first place in the team race) represented Scotland in the first post-war international at Ayr Racecourse.” In the International he finished 36th to be a counting runner for the team. Thirty sixth wasn’t too bad when it is noted that the Scottish team had been walked over the nine-mile course on the morning of the race to familiarise them with the trail to be followed! Immediately after the War, Harry Howard was one of the very best distance runners in Scotland. On 6th April 1946, in the relay around Dundee, he ran the second stage for Shettleston Harriers where he had the second fastest tim but was part of the winning team. In the very first issue of the ‘Scots Athlete’ magazine (April 1946) the two favourites for the SAAA 10 miles track title were JE Farrell and Harry Howard but Howard, after running in the middle of the field for the first few miles, dropped out at four. But the December 1946 issue of the magazine in a preview of the Nigel Barge Road Race at the start of 1947, read. “This very interesting trail of just under five miles of undulating road is ideal for affording cross-country runners a chance to test their sped before getting down to serious cross-country work. The last two races run over this course have been chiefly notable for the grand running of Harry Howard of Shettleston who has twice smashed the record , the second occasion beating the figures set up by himself the previous year. His time of 24:04.8 is a target that will take some beating as on that occasion he ran clear away from his field, including myself. Afflicted by a stubborn spell of staleness Howard is training steadily and gradually in an attempt to regain his old form.” In the 1945 race he had won in 24:12 from 12 teams and a total of 86 runners, and in 1946 it had been a victory from 107 runners. 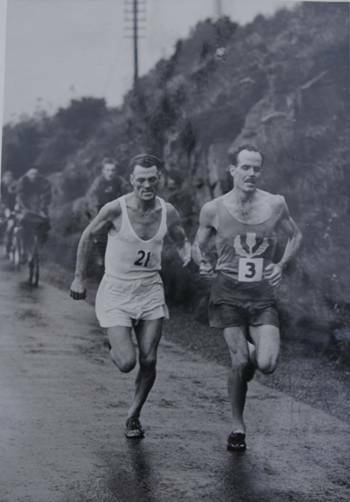 Unfortunately this time, in 1947, the race went to G Lamont (VPAAC ) who won in 24:35. In the National championships of 1947 he was ninth finisher in the National Cross-Country championship and led the club home to fourth place. In his preview of the SAAA Marathon in 1947, Emmet Farrell thought that Howard might have been among the challengers for the title, saying that “with several course records to his credit over distances from 12 to 15 miles, can be brilliant or mediocre and has recently blotted his copybook by having to retire twice in subsequent races, yet this unorthodox runner can never be left out of the reckoning.” Howard did not run the marathon this time around though and after a successful summer season went into the winter 1947/48 cross-country season. As usual for Howard, he missed many of the championship races, including relays until the national came along and in the 1948 National he was fourteenth individual, fifth Shettleston Harrier and a member of the winning team. In his preview of the 1949 national championship, Emmet Farrell forecast a team victory for Shettleston – and with runners such as Flockhart, Craig, Howard, McLennan, Stuart, Mills, Wallace Laing and others, all named by Farrell – they were certainly in with a shout. But Howard, despite being a cross-country internationalist, missed more cross-country races than he turned out in. That season alone he had missed the county and district championships. Would he appear in this one? He did, he finished seventeenth, was again fifth club man home and a member of the winning team. This was however his last National appearance until 1953. He ran in his first English National that year finishing in 71st . The first post-war Edinburgh to Glasgow Relay was in April 1949 and Harry was on the fifth stage where he set the fastest stage time of the afternoon – one of six club runners to do so for the winning team. In August 1949 the ‘Scots Athlete’ commented on the victory at Carluke of CD Robertson in the very fast time of 65:31, ‘or 31 seconds outside the course record standing to the credit of Shettleston’s Harry Howard’. Missing the SAAA Championship and not appearing in the City of Edinburgh marathon, Harry turned out in the Perth to Dundee road race at the end of August but after starting steadily, he dropped out of the race which was won by Robertson with Gordon Porteous of Mayhill second. There are comments throughout his career about his ‘inconsistency’ and occasionally dropping out of races with no reason given in the reports. The following winter, 1949/50, there was no Harry Howard in the McAndrew Relay in October 1949 with the Shettleston squad of Wallace, Bannon, Burton and Bickerton finishing second to Victoria Park. 1949 was a year when there were two Edinburgh to Glasgow relays with the second being in November. Harry ran the fourth leg this time, and the team won again. Bearing in mind that the club had Jim Flockhart, Ben Bickerton, Eddie Bannon and Clark Wallace among the forces at their disposal, it was no surprise to see them take the gold. In December in the Midland District relay he ran in the second team and was not only merely third quickest there but slower than two of the C team runners. Into 1950 and Howard was tenth in the Nigel Barge Road Race at Maryhill to be second counter (Bannon was fourth) for his club team in third place. Although he started the year by finishing 23rd and well out of the counting six for the winning Shettleston team in the Midland District Championships held at Motherwell on 4th February, he missed most of the other races such as club, county and national championships but ran in the English National again, this time being 80th behind Craig, Bickerton, Flockhart and Wallace. As fifth Shettleston runner he contributed to the third pace medals collected. Winter over, he was back in action on the roads at the age of 36. 1950, however was to be his big year – the one in which he won the SAAA marathon. In mid-May, Howard was second to Charlie Robertson in a 16 miles road race, in which JE Farrell was third. Then on the following Tuesday he was second to Farrell at the Ashfield Speedway Track in a one hour race where Farrell covered 11 miles 241 yards (a new Scottish record) with Howard managing 11miles 180 yards. Harry was a prolific racer and turned out week in, week out all over the country -n he held many road race records – Clyne and Youngson mention the Carluke 12, the Glasgow to Hamilton 13 and the Kilbarchan 14. He had in fact run a hard 14 the week before the AAA’s championship. He did not turn out against Robertson in the Perth to Dundee road race at the end of August, but on 2nd September he defeated Farrell, England’s Geoff Iden and Jimmy Henning of Duncairn Nomads in Ireland at the Edinburgh Highland Games round-the-city marathon. His time was 2:40:10, three minutes in front of Farrell (2:43:46) and five ahead of Iden (2:45:47). By the end of the summer he was ranked number one road runner in Scotland ahead of Charlie Robertson, Jack Paterson and Emmet Farrell. 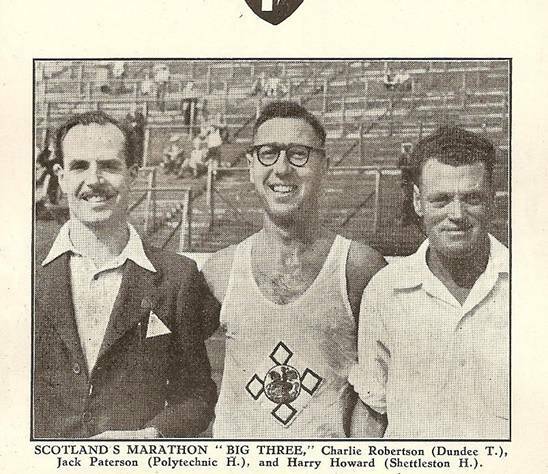 The ‘Scots Athlete’ said of Howard’s summer – “Pride of place must go to Harry Howard (Shettleston) who won convincingly the two Scottish Marathons and was a brilliant third at the British. He had only one other win – at a shorter distance (Milton AC race).” The rankings of the first five – 1. H Howard; 2. CD Robertson; 3. JE Farrell; 4. W Gallagher (Vale of Leven); 5. A Arbuckle (Monkland Harriers). Before we finish with 1950, Harry was understandably a hero in Kilmarnock and two weeks after he won the SAAA marathon the following review of his career to that point as told to a local Kilmarnock man appeared in a local paper and it was reprinted in the ‘Scots Athlete’ at the end of the year. 1951 did not start well for Howard – seventh at Morpeth and fifteenth in the Nigel Barge were maybe not the openers he had hoped for. He missed the Midland Championship at the start of February but in the National on 3rd March, he was not in the club counting six men. Always better on the road than the country, he had nevertheless won a cross-country international vest but maybe at the age of 37, what Emmet Farrell called ‘Mr Anno Domini’ was starting to catch up on him. He did however form part of the team which finished second in the English National on 18th March – he was fifth counting runner in 54th place. In his preview of the SAAA Championships, Farrell described Howard’s present form and ‘uncertain’. In the event, Howard did not compete. He was very involved in the Perth to Dundee race on 25th August however when he was second to CD Robertson (2:01:41) in 2:02:13, with England’s RW McMinnis (2:03:47) in third after a very hard race with Andy Arbuckle, Joe McGhee and Alex Kidd among the following runners. In his last race of the summer, the City of Edinburgh marathon, He and Charlie Robertson were left in the invited runners dressing room after the other dressing room for the others had been cleared. The result was that they had to join the race after the first lap had been run and ran the race knowing that they would have to run the extra lap when they returned to the field. Nevertheless they managed to work their way through the field and finished with Robertson first in 2:38:15, JW Stone (RAF) second in 2:38:33 and Howard third in 2:40:50. He missed the McAndrew and Midlands relays, nor was he out in the Edinburgh to Glasgow relay where he might have been expected to play a significant role for Shettleston. He also missed the Midland and National championships. Was his career over? In his preview of the SAAA marathon, Farrell commented on the chances of Robertson and Jock Duffy from Broxburn, but then added, “However, should ex-champion Harry Howard who recently made an auspicious come-back after a spell in the wilderness, decide to enter the gruelling distance race he could be Robertson’s closest rival and would certainly prevent the Dundee man from loitering.” He was not however a competitor and although he missed almost all of the cross-country season of 1952/53, he ran a good National finishing 14th to be the third counter for the second placed Shettleston team. Next appearance was in the Edinburgh to Glasgow relay where he pulled up one place on the second place, getting Shettleston into second, and he himself had second fastest time of the day on this very difficult stage. At the end of the season he turned out again in the National where he finished 37th – a non scoring runner for the winning team. This was his last race in the national, and there were to be no more Edinburgh to \Glasgow relays – the era of Everett, McGhee, Fox and company had arrive and by 1956 Howard was 37 which was a old for a runner in the 1950’s. His 1950 win in the marathon had started something for Shettleston however – by 1959 club men had won the event six times, picked up a silver and a bronze and, for that decade, dominated the championship.